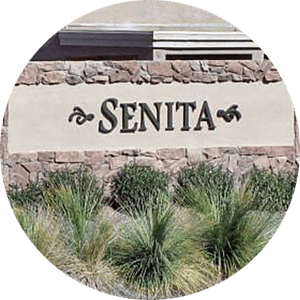 Senita is located on Honeycutt Road, south of the Villages at Rancho El Dorado. It includes over 1300 homes built by Pulte and DR Horton. The community features 2 entrances, basketball courts, play lots for children, and homes of all sizes. It sits conveniently between 2 shopping areas with access from the north off of Honeycutt rd, or the south from the Maricopa Casa Grande Hwy.